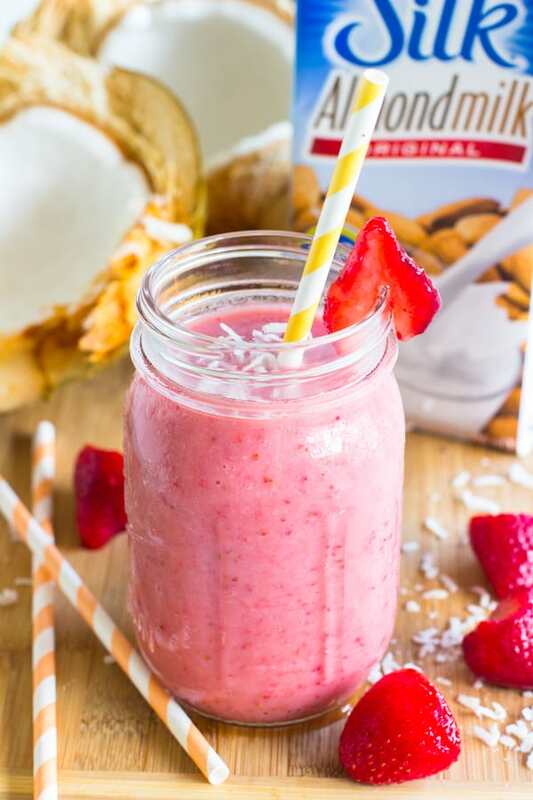 This Strawberry Coconut Smoothie is perfect for both spring and summer! 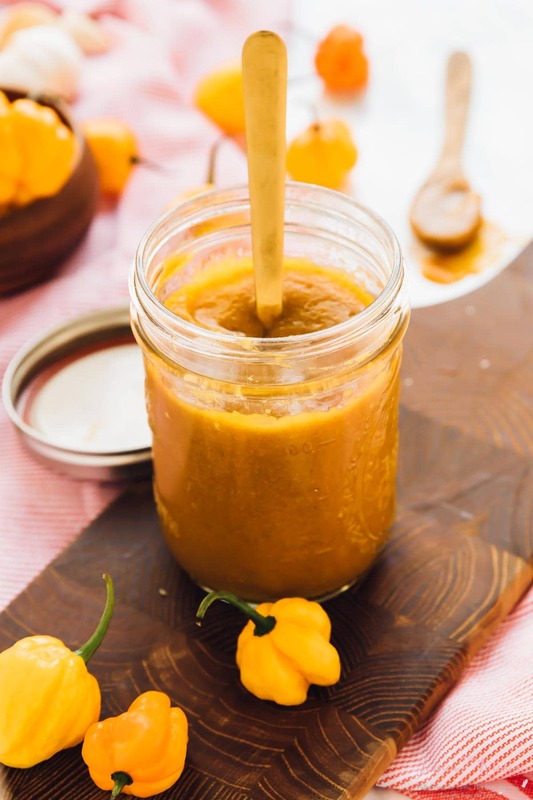 It’s bursting with delicious tropical flavours and packed with nutrition! Can you believe we are already a month into Spring? We are certainly experiencing full Spring weather. The days have gotten much longer, and by 6 pm it’s still pretty bright outside, florals and brights are all about and I’m using every opportunity possible to incorporate berries into everything. At the rate we are going, it’s going to be summer in no time. So, if you haven’t been celebrating spring and soon-to-be summer, why not start now with this delicious smoothie? Let me tell you all about it. I’m a huge smoothie person. Thin smoothies, thick smoothies (thick smoothies are the BEST), fruit smoothies, or green smoothies, if it’s a smoothie I’m there. I’m sure you get my point right now. 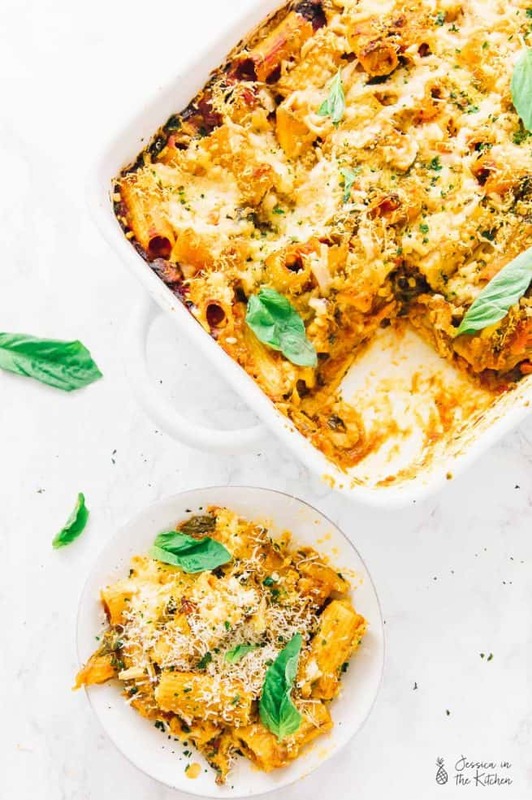 Hence, I was pretty excited to pair up with Silk again for this post, because as if I’ve said before, it’s the only kind of non-dairy milk that I drink. Not only that, but they have quite the selection of smoothie bases whether you’re looking for a delicious simple base, or a more indulgent base (Silk Chocolate Soymilk, I am looking RIGHT at you and our good memories together) or even a yogurt base. Silk is on a mission right not to provide THE smoothie solution and they are currently giving away a 10-speed Kitchenaid stand mixer so sign up for your chance to win PLUS get a free coupon. I see a win win situation right there. So let’s get right to this delicious smoothie right here. Since my favourite is there the Silk Almondmilk Original, I decided to use that as my base. Then I thought, well strawberries is not only a smoothies must, but it’s spring! Per-fect. Then out of nowhere, the need for coconuts popped up in my head. Coconut water! It’s the perfect natural add in in a smoothie and is packed with nutrients and electrolytes on top of the already nutritious Silk Almondmilk Original and strawberries. Guys, I don’t know why but instead of buying coconut water I insisted that we needed FRESH coconut water, which is of course the best, so off to my backyard the Mr. and I went! Two coconuts picked from the tree later, we had quite the experience hacking them open. I drank coconut water straight from one (whoops…) and we used the water in the other for the smoothie. The result? A delicious, natural and crazy nutritious smoothie. Could there by any two other flavours that blended so well together?! I loved the taste and drank it right up. You could add a natural sweetener if you like your smoothie sweeter (included in the recipe) but I enjoyed the smoothie just as is. 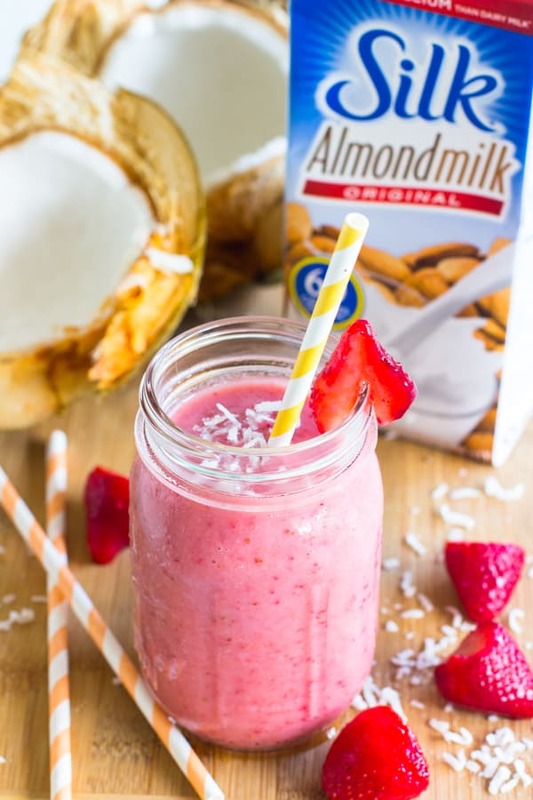 The Silk Almondmilk Original adds a great creamy base perfect for smoothies, the frozen strawberries blend together flawlessly and the coconut water gives it that kick of freshness and tropical-ness that we are all looking for in smoothies. This is one is being added to my list of favourites! PS – if you have access to coconuts, save that jelly on the inside! It is perfect for thickening up puddings and smoothies too, or eating by itself! Don’t forget to sign up for Silk’s Newsletter to get a free coupon AND for a chance to win that 10-Speed Stand Mixer! Happy Sipping! Blend all the ingredients together in a high speed blender. Enjoy! 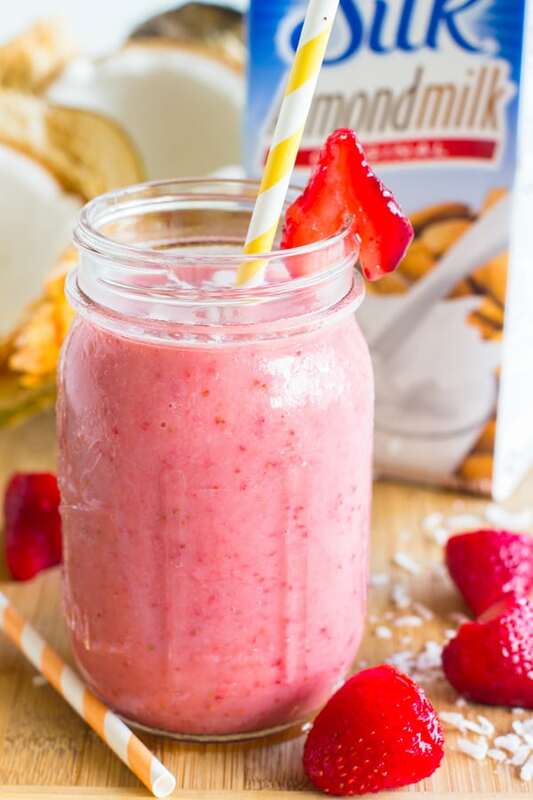 This Strawberry Coconut Smoothie is perfect for both spring and summer! It’s bursting with delicious tropical flavours! The days are definitely getting longer and it makes me happy! I’ve had enough of the cold weather! This smoothie looks fantastic! I can totally see myself sitting out on the deck enjoying one of these. Thanks Danae! Love that idea! strawberries and coconut are one of my favorite combinations, have to try this! Thanks Sophia!! And I’m glad to be back! Glad to see you back Jessica! I’m a smoothie girl also and love Silk milk in my smoothies. This smoothie looks delicious. Thanks Chineka!! I’m glad to be back! Yay for smoothies! I’ve been having one almost every morning … especially now that it’s warmer by us! This flavor sounds awesome! Thanks Ashley! Loving the weather! This sounds yummy, I can’t wait to try it. I just found your blog and I love your receips. I would love to come to dinner. Your blog is warm and it sounds like you love to cook. I can smell all the wonderful yumnist ( my new word) filling the air in your kitchen. I use to cook a lot then my husband cooked when I got married. In the past two years since my husband passed away . I have been diagnosed with RA ( Rheumatoid arthritis) and I no longer cook much . 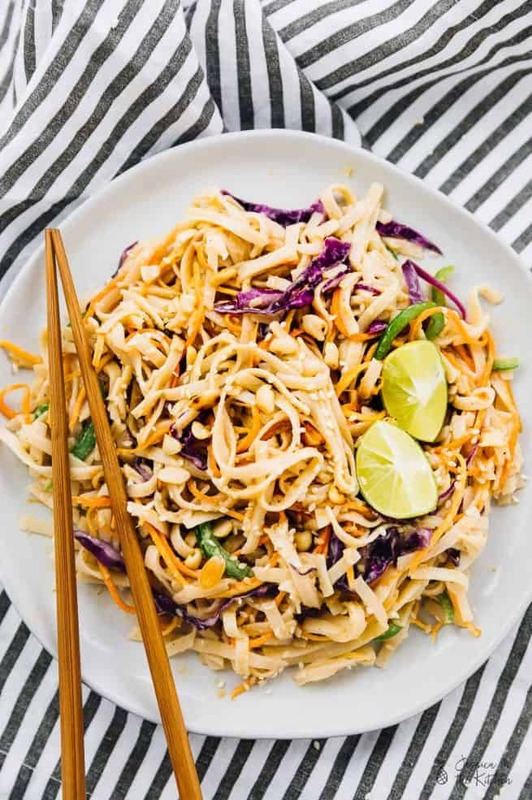 your recipes look yummy and easy plus healthy which I am all about now. Thank you and I look forward to seeing more yumminess. Ever need a food taster let me know I am available. Thank you for your kind words!! I’m so sorry to hear about your husband and your condition 🙁 xoxo I really do hope it gets better since you sound like you were amazing in the kitchen and that you have a great spirit. :). I hope if you get to try any of my recipes that you really enjoy them! And haha if I have a taste tester needed I will definitely tell you! Have a great day! Praise Yahshua for the comfort of the Holy Spirit. Family can be those in Christ who love you and share your burdens! And praise Yahshua for dying for our sins and sicknesses! Jewsforjesus.org is a good website to find comfort and a community of believers! Thanks Izzy! It’s getting hotter and hotter here each day…easy to say we are in summer!